Each winning school submitted an application highlighting innovative plans involving STEM education and using the YouthTouch System to integrate technology across the core curriculum. 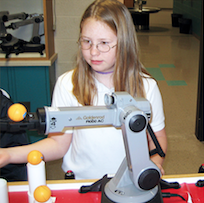 The 1:1 match award from Goldenrod helps elementary and middle school educators bring hands-on robotics and fluid power equipment, as well as additional technology tools, curriculum materials, and professional development to their learning communities. “The quality of the applications has risen markedly since we began this program in 1997. While the schools and districts receiving the grants represent a varied cross-section of the educational spectrum, all have shown an ability to unite their community and present a coherent vision of their goals along with a targeted approach for achieving them. These winning proposals are not necessarily elaborate; they are educationally sound. I’m confident these schools will have long term success and I’m eager to help them achieve it.” ~ President, Lea Melchior. Through our YouthTouch Technology Integration Matching Grant & Pilot Program, Goldenrod supports schools to make the most of fewer resources, lessen educational achievement gaps, promote academic achievement, and advance a generation of children ready to tackle the 21st Century. This entry was posted in YouthTouch Schools by Catherine Glaser-Carnley. Bookmark the permalink.